Coconut and chocolate is right up there on my favorite flavor combos list. Last summer, M&Ms came out with a limited edition coconut version that I ran all over the state trying to track down. Finally an awesome friend came to my rescue by sending me a HUGE box full of them! A lifetime supply of coconut M&Ms. Ever since, I’ve been thinking about what I could make with them that didn’t involve just putting them in a cookie. And that’s how I ended up making black bottom coconut bars. 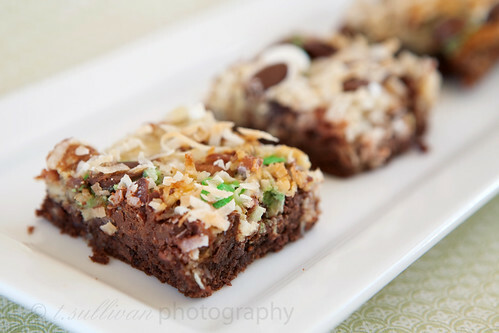 These bars are moist chewy brownies on the bottom, topped with coconut, pecans and M&Ms (or chocolate chips). In other words, divine. The coconut M&Ms didn’t look as pretty as I had hoped, but they tasted great so I didn’t mind. I’m glad I gave away a little more than half the batch, because I seriously could not stop eating them. I took half of the bars with me to my in-laws’ Easter dinner, where they promptly disappeared despite having to compete with a coconut cake, a banana cream cake, and ice cream. They’re that good. 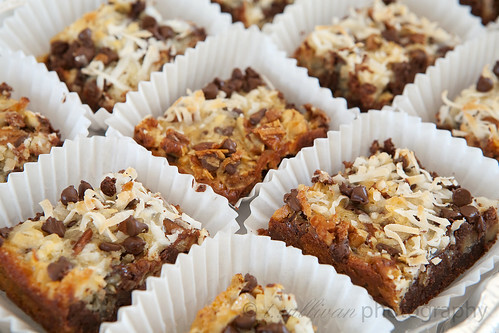 If you like brownies and you like coconut, you really need to try these seriously addictive bars! I know it sounds fast and easy, but don’t try chopping the M&Ms in a food processor. It won’t work. A serrated knife and patience works best. Once the bars are out of the pan, a pizza cutter makes quick work of cutting them into bars. I used Hershey’s Natural Unsweetend cocoa powder. Preheat oven to 375°F. Line a 9×13-inch pan with aluminum foil, leaving at least 1-inch overlap on each side. Spray foil with non-stick baking spray. In a small bowl, whisk together cocoa powder and flour. Combine melted butter, sugar and salt in a medium bowl and whisk together. Whisk in eggs until completely combined, then whisk in flour mixture. Batter will be thick. Spread batter into prepared 9×13-inch pan and bake at 375°F for 10-15 minutes, until top is set and edges have just begun to pull away from the pan. Do not overbake! Let brownie layer cool while preparing coconut mixture. Lower oven temperate to 350°F. In a medium bowl, whisk together sweetened condensed milk, egg and extract until well combined. Stir in 1 cup of coconut, pecans, and 1/2 cup of M&Ms or chocolate chips. Dollop coconut mixture over baked brownies and gently smooth into an even layer with a non-stick spatula. Sprinkle with remaining chocolate pieces and coconut, gently pressing them into the bars. Bake at 350° for 20-25 minutes, until the top is golden brown. Cool for 15-30 minutes in the pan, then using the foil overhang, gently lift the bars out of the pan. Pull the foil away from the sides of the bars and cool completely before cutting into squares. These look awesome, my dad would love them! I had no clue those M&Ms were limited edition. Did you see they are coming out with pretzel ones now too?!? Oooh these are beauties! They remind me a bit of german chocolate cake, they look delicious. It doesn’t get better than this, looks delightfully rich! Oh wow they are beautiful! Love it! i am SO jealous of your stash of coconut m&ms! SO jealous. i had one bag, ONE BAG, before they were gone and that was just enough of a taste to make me obsessed with them. sigh. I can personally vouch for the awesomeness of these cookies! They were delicious. oooh, these look good! I tried almond joy “bites” which are essentially coconut m&m’s and they are crazy addictive. That looks great. I love both chocolate and coconut. Those look really good, but I’d be afraid I’d eat them ALL. Somehow. Someway. I am going to have to find these coconut M+Ms. Amazon.com. Here. I. Come. These look awesome! I’m pretty sure I could eat all of them. In one sitting. Those look amazing! I just made up a cupcake using the exact same m&m’s!!! i was able to find them at my local dollar tree…i think they should be regulars not limited.